Grease a 6.5 inch spring form pan and set aside. If you don't have a sling, make yourself a foil sling to be able to get your cake out when it's done. In a medium sized bowl, place chocolate and butter. Melt in the microwave in 15 second increments until smooth. When completely melted, add the egg yolks and the orange zest to the chocolate mixture and stir to combine. In a separate bowl, beat the egg whites on high speed with a handheld electric mixer until white and foamy. Slowly add ½ cup of sugar into egg whites. Continue beating on high speed until soft peaks are visible. Pour mixture into your greased spring form pan. Add one cup of water to your instant pot and put in the trivet. 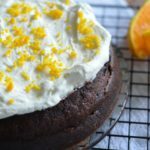 Place cake in the Instant Pot with the foil sling.. Loosely cover the top of your spring form pan with foil. Close your Instant Pot and cook cake on manual high pressure for 35 minutes. When timer is up preform a quick release of pressure. Set cake aside to cool completely. While cake is cooling, in a medium size bowl, beat together heavy cream, orange extract, and powdered sugar until firm. Top cake with whipped topping and enjoy!